Are you looking for Advanced World, State, and City database Script? Your Search will end now, since you have reached the right place. 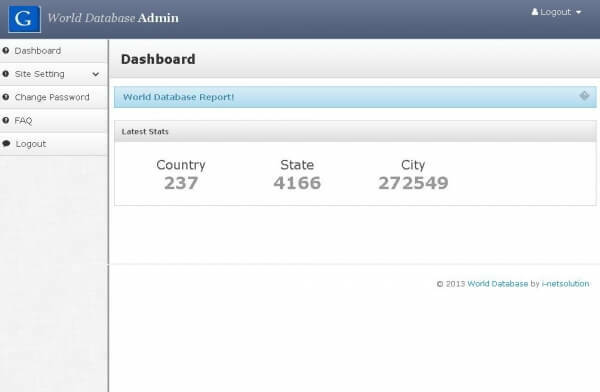 We have Ajax based Country, State, City Database. It’s comes with Mysql. It update every month with free of cost and our script is suitable for all kind of website like Travel booking, Job portal, Dating script, B2B script and etc. I’ve been very impressed with the script quality, continuous improvements and customer support. I wish keep this way in your future also. I am a total beginner!!! Bought this script in 6 weeks ago, I had all my questions answered within 6 hours or less you are doing great job well set. The Best Support & script By Far! Anyone looking to buy a script should check this one! It’s not only the best script I have ever used but also has is my opinion the best support system you can get. If you ever need help with anything just ask the question in the support you never wait more than a couple of hours for a reply (mostly they are replied within 1-2 hours) thank you guys!!! This script was such a fantastic one I ever used for this much of functionalities and features.